Josie and her children’s father have split up, she’s been sued by a former patient and lost her dental practice, and she’s grieving the death of a young man senselessly killed. When her ex asks to take the children to meet his new fiancée’s family, Josie makes a run for it, figuring Alaska is about as far as she can get without a passport. Josie and her kids, Paul and Ana, rent a rattling old RV named the Chateau, and at first their trip feels like a vacation: They see bears and bison, they eat hot dogs cooked on a bonfire, and they spend nights parked along icy cold rivers in dark forests. But as they drive, pushed north by the ubiquitous wildfires, Josie is chased by enemies both real and imagined, past mistakes pursuing her tiny family, even to the very edge of civilization. 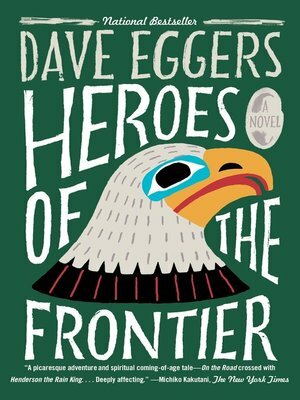 A tremendous new novel from the best-selling author of The Circle, Heroes of the Frontier is the darkly comic story of a mother and her two young children on a journey through an Alaskan wilderness plagued by wildfires and a uniquely American madness. This entry was posted in eBook Friday and tagged fiction, literature, thriller. Bookmark the permalink.